I have a 1973 Monte Carlo that I’m restoring. I’ve fixed most of my issues so far with little adjustments and cleaning. I can play 1 player no problem. Everything works. When I try to select a secondplayer the light does not move over to 2 players and I am also not seeing the ball in play light up. The bulbs are good. 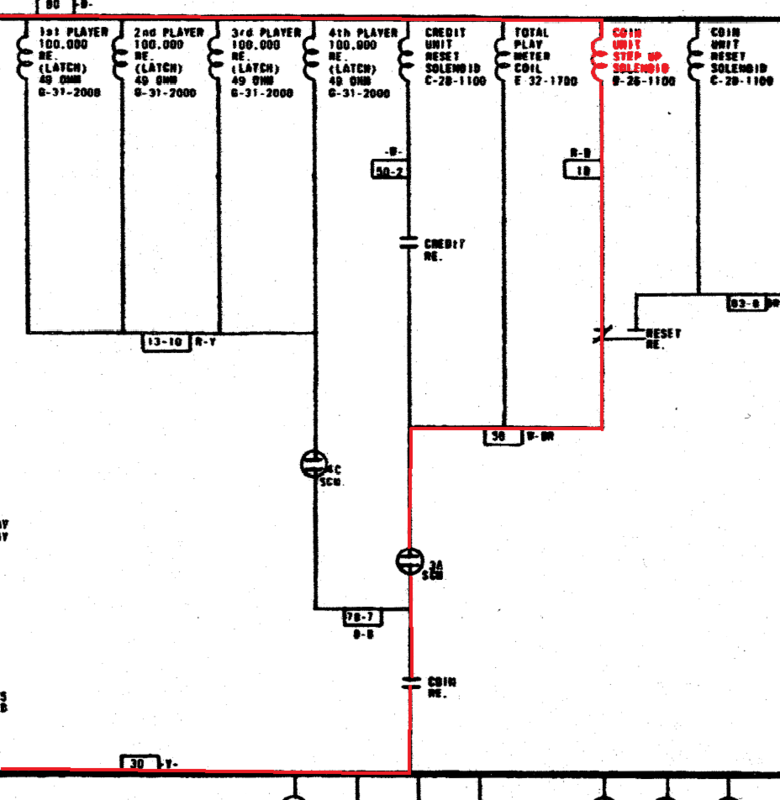 I went through the diagram but am having a hard time trying to figure out where to start. Any help would be greatly appreaciated! Check the Game Over make/break for the lites. Does it play correctly even though they don't display? When I select 1 player, the lights all show one player however the game plays all the way through to the 4th player each time even though the players 2-4 score boxes the lights are off. If I select 2 players it still plays through all 4 players, and same with 3 players selected. I'm not sure where to go from here to fix that. I also have one question that probably sounds like a stupid question...What are is the 00-90 unit Disc do and what to the green numbers at the top of the back glass mean when they light up? I'm talking the 00 10 20 30 40 50 60 70 80 90 numbers? Thank You guys for the quick help. 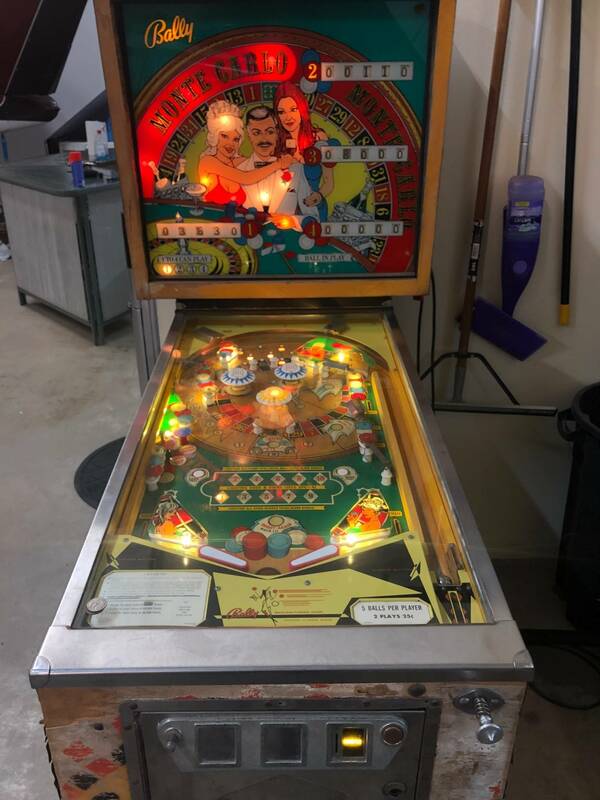 I'm excited to get this game up and running and amazed at the condition of it considering it's 46 years old and everything almost is working on it. Those are the match lights, if the first two digits (tens) match the number that lights up after game over scores one replay. What did you clean the units with? The coin unit is responsible for the amount of players, the player unit for the player up. If you play 1 player, when the outhole is made after the bonus count the player reset pulls in for keeping it on player one, controlled by coin and player unit. I cleaned the wheels with a ink eraser then the contacts with a very fine sand paper 1000 grit. I then put a very small amount of dielectric grease on them to keep them smooth and protect them. They are moving really good and correct right now. Many Ballys of that era used this larger style 00-90 unit disc. It advances each time a 10-point score is hit. It actually has 2 separate functions. The first is to rotate through the match lights which are the ones at the top as you described. The second function is to control a "special feature". This special feature varies from machine to machine, but it is a basic operation. Somewhere on the playfield some lights move around as the unit advances, changing scoring opportunities or something on the playfield. 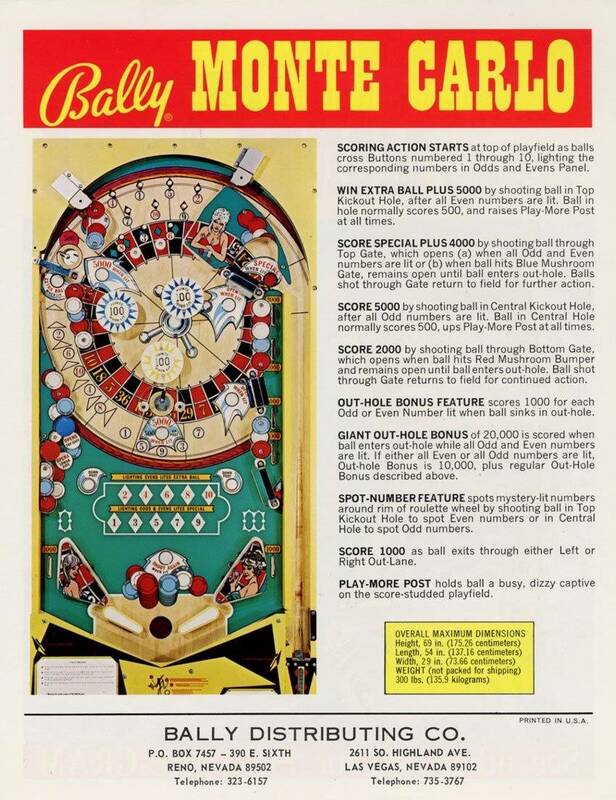 In the case of Monte Carlo, it control the "Spot Number Feature" as shown in the flyer. So as it advances you should also see the number lights around the outside edge of the roulette wheel changing. They will change with odd/even pairs. If everything is clean and smooth with that unit then those lights will change around smoothly as the unit is stepped, as will the match lights. If it is gunked up then they will behave erratically. I know this because mine did it. I will come back later with some ideas, I can't do it right now due to time limitations. I have that part of the circuit written out somewhere. The number of players function involves several things including the player up unit and the coin unit. I figured out the Player select issue. The Coin unit when I put it back together had an arm the was slightly not contacting, I adjusted it and all works correctly now. Thank you for the scoring explanations, can't wait to play this thing after work and check all of the scoring and verify it is functioning correctly. I have one question and it may be operator error. Does the game only hold one ball at a time? or when the extra ball light comes on is it supposed to kick out another ball? If so where do you put the other ball? I'm almost done getting it working 100% then it's going to be time to refinish the wood cabinet and replace the legs. Does the game only hold one ball at a time? or when the extra ball light comes on is it supposed to kick out another ball? Only one ball. 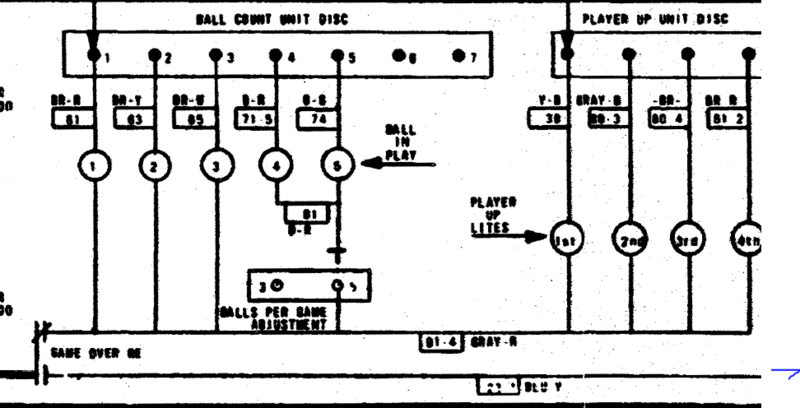 It means that you get 6 plays instead of 5.